Transform your unfinished or previously finished basement into a healthier, comfortable living area. 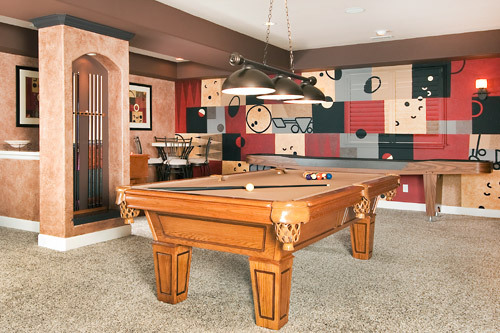 There's a lot to consider when planning a basement finishing project. Besides what you're going to do with the space - which is the fun part - you need to decide on how you're going to finish or remodel it and that can be a daunting process. But we can help. Whalin Construction specializes in various finishing methods, including standard drywall and many basement finishing systems. Transform your older finished basement into your favorite room in the house. Whalin Construction specializes in these transformations — from an amazing home gym to an incredible home theater, family room, home office or more! 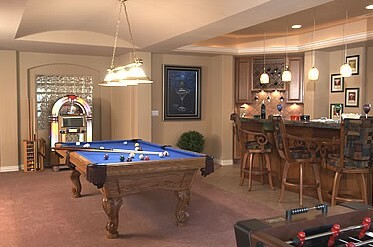 Planning a basement renovation can be an exciting. There’s so much to think about, and involving your family is a great way to make certain everyone has a stake in the final outcome. When you’re finally ready to put pen to paper and proceed with your plans, it’s important to know the steps to finish a basement before you get started. Consider these details that can make your basement a satisfying, comforting place to relax and live. Then carry through with your plans with the help of Whalin Construction.. Step #1: Waterproofing your basement. This will help protect your space and ensure your belongings stay safe, dry and intact. If you’re aware of previous water leaks or seepage, make sure we are aware of them and takes steps to ensure they don’t happen again. There’s nothing worse than a wet or flooded basement that must be ripped out and reconstructed. Step #2: Think next about the lighting you’d like to install and the electrical system you’ll need to support it. If your basement doesn’t have plenty of natural lighting, you may need indirect, as well as direct, lights. Step #3: Consider using the best insulation money can buy. Not only will it protect your finished basement by keeping the cold air out in the winter and the hot air out in the summer; it will also curb your utility bills and help conserve energy. We will discuss the benefits of various types of insulation with you, we are very knowledgeable in this area and can make recommendations that fit your lifestyle and budget as well as your dwelling. Step #4: Check out different types of flooring and determine which products fit your taste and the environment you wish to achieve. Though some people prefer the feel of soft carpet under their feet, using a thick, plush material such as this in a basement area may not be wise, simply because of the risk of water exposure. Installing real wood floors could also present a problem, for the same reason. A wiser choice might be ceramic tile, vinyl or indoor/outdoor carpeting. Step #5: Cover the insulation with sheetrock, paneling, or some other type of protective cover. With the proper covering on your walls, you’ll be free to paint and add wainscoting, chair rails, a fireplace insert, and/or windows or shutters. Once you’ve decided to finish your basement, turning it into the usable space you desire can be one of the most rewarding and value-adding experiences you’ll enjoy in your home. So plan ahead, do things right the first time, take advantage of our knowledge--and finish a basement with style and ease. It’s easy with Whalin Construction!